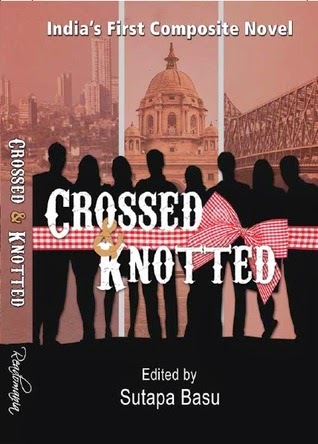 Crossed & Knotted is India’s first Composite Novel, a book written by fourteen authors in close collaboration with each other. The chapters, each a story in itself, are knotted with one another through characters, events, settings and emotions. The result is a read that criss-crosses through a multitude of emotions bringing out deep rooted human desires. They narrate tales of love and betrayal, suspense and mystery, courage and dilemma, along with hope and resilience. Read it for a taste so tantalizing, that your mind will surely be craving for more! Sutapa Basu is an Honours scholar from Santiniketan and holds a Masters degree in English Literature. Her professional career has seen her as a teacher, editor, and publisher. She has worked with renowned international publishing houses like Oxford University Press and Encyclopaedia Britannica. In the last five years of her professional career, she has launched 111 educational titles, 33 CDs and digital products, a language lab and a website. She has also developed and edited over 450 books over the last thirteen years. India has traditionally been the land of storytellers and a lot of us have an inherent skill of creating good plots, stories and narrations. With a little encouragement and support, many more authors can be widely read. This is the essence of Readomania-an initiative that nurtures emerging stars of the literary world. Readomania is an online content discovery platform that brings to life a whole new literary world, with stories, authors, books and a lot more. We also have a publishing house that takes the best of Readomania from the online format to print editions and launches debut authors. Our focus is to bring to the market, new authors and novel concepts, a composite novel being one of them. Our previous book, Chronicles of Urban Nomads, a collection of short stories, was also an experimental publication. It would not be an exaggeration to say that Readomania is the talent hunt in fiction that goes a step beyond, nurtures talent and showcases it to the world, in the process, creating a powerhouse of content. Our website also has a lot in store for the reader. Since the content is edited and curated, by a strong team of editors, readers get quality reads on a platter. The variety on Readomania is impressively vast; we have romance, emotions, thrills, travel, humour and drama. Accessing Readomania makes for a perfect break of fifteen minutes from your daily grind. The website was launched in January, 2014 and is already very popular with about 3500 registered users, of which 300 members are active contributors and authors. The site also boasts of 800 online publications and more than three lakh page views till date. We all know about anthologies with short stories – but “Crossed & Knotted” is more than that. It’s a so-called composite novel where 14 short stories form one book with a common story arc, although each story can also be read as a stand-alone. Sounds fascinating, doesn’t it? The 1st story in the book is “A Curious Dalliance” by Sutapa Basu. It introduces the main character Sudip and sets the scene and pace for the coming chapters. I liked the way the protagonist never even knew what came upon him when Megha decided his fate for him. He ended up in a marriage that reads a little like hell and starts off with a ‘bang’. It was interesting to see the wife presented as the villain and the husband and his family as the victims – but then came the shock. Very clever! The 2nd story is “The Diary of Joseph Varughese” by Ayan Pal. I got to know Shivi, who had only been a baby in the first chapter. Her diary entries fascinated me and showed the author’s understanding of the human mind and soul. The first paranormal / mystery element of the novel was cleverly introduced in this story. And let’s not forget about ominous James entering the picture. Beware, beware! The 4th story is “The Real Fiction of Illiana Braun” by Arvind Passey. The humorous style of the author made it an entertaining read. Illiana and Varu seemed like two uncommon characters and would have deserved a book just for themselves. The 5th story is “A Burning Candle” by Mithun Mukherjee. This is yet another tale of people meeting and lives colliding, and it carried narrative power as well as philosophical gems. Illiana made a reappearance, and I got another look at the power of a certain diary. The ending made me shiver. The 6th story is “Relic to Ruins” by Avanti Sopory. Catherine from the previous chapter stood in the limelight again, but in a different way. The setting and characters really came alive in this chapter. I caught a glimpse of Afghanistan and more danger. The 7th story is “Leap of Faith” by Bhaswar Mukherjee. Picking up the thread, the chapter revolves around Afghanistan and is told from the POV of Jabar. I got to know more about Jameela from the previous chapter, and had the feeling that the tide was changing. There was a positive feel to the story. Many more characters added even more hope. The 8th story is “Reclaiming Life” by Anupama Jain. The style and protagonist differed a lot from what I had just read, but that was refreshing and entertaining. It was easy to identify with Poorni and root for her. The ending asked an important question that prepared me for the rest of the book. The 9th story is “Dragon Lady” by Deepti Menon. The title itself was intriguing, and the story started off with a bang and held me captive right throughout. The humorous tinge to it, combined with the effortless writing and the many conflicts thrown into the spicy mixture, made for a very entertaining read. Kamu sounded like a real handful, and her baby Pankaj added to the hullaballoo. Binoy was interesting and fitted into the picture just perfectly. I got to meet Poorni again, and what a surprise that was. Let’s just say that the title was done full justice by the author. The 10th story is “For a Speck of a Moment” by Amrit Sinha. It shone more light on Binoy and made me rethink quite a few things. The chapter struck me as full of action, and it carried enough potential to deserve a whole book. Binita made it shine even brighter. The 11th story is “To Ma & Pa, Con Amore” by Monika Nair. It read a little like a family saga and was full of emotional sensitivity and brilliant buoyancy at once. I fell in love with the narrative style – and Mona Lisa was a refreshing whirlwind breezing through the chapter. This story felt the most ‘modern’, ‘real’ and ‘light’ to me. Prepare yourselves for Binoy’s re-entry. The 12th story is “Look Beyond” by Amar Lakshya Pawar. I could sense that the book was gearing up for its end because we seemed to come closer to full circle. The rather short chapter revolved around Aditya and threw up a lot of questions while answering others. I met the Three Witches again, something I had been hoping would happen. The 13th story is the oddly but aptly titled “Dawn at Dusk” by Bhuvaneshwari Shankar. The previously introduced Meena takes center stage in this chapter that races towards the end of the novel. I loved the fast-paced yet sensitive style of the author. Oh, did I mention that I got reacquainted with Sudip from the 1st story? Throw in Shivi too, and you feel a little like at a highschool reunion. The 14th story is the perfectly named “The Last Act” by Arpita Banerjee. The author probably had the most difficult task, and she rose to the challenge brilliantly. The first sentence pulled me in, and I was left breathless right throughout the story with its clever climax. Meena (together with Pragya) carried me through the chapter and made me realize again how crazy love can make us sometimes. Sudip closes the curtain on a book that is definitely worth this long review. All in all, I found “Crossed & Knotted” to be a refreshingly different and rewarding experience. It was at times a little difficult to keep up with all the characters and to build a whole picture from all the puzzle pieces presented in so many ways. Nevertheless, the story’s overlying theme of love and lies and life held my attention. Well done! You've just given me a fab idea... your review of my story in this book says, and i quote: 'Illiana and Varu seemed like two uncommon characters and would have deserved a book just for themselves.' Well, you never know, i might actually take your suggestion seriously. Thank you for recognizing elements of humor in my writing style. Loved the meticulous way you've gone and picked out the USPs from each story... you are indeed a talented reviewer. Thank you, I'm happy my review made you happy. And do let me know if you ever decide to write that novel! Feels good to know that some parts of my story will 'stay with you'. Thanks a ton for the review. It's very well written. You're welcome. I think the attempt was successful. Looking forward to more experiments in the future. Devika, a brilliant review that brings out all the twists and turns of the book, in your own inimitable style! Thank you ever so much for all the positive comments, and I, for one, am overwhelmed at the meticulous way you brought out the nuances of each tale! A masterly review, indeed! Thank you for your praise. The book and all the authors deserved the in-depth review. My apologies for the delayed response. It was very kind of you to be so encouraging. It means a lot to us. Thanks a lot for your time and effort in reviewing our book.